4015 2225 Laser Hot Hits. Talking about Radio Seagull. Good signal. SINPO 44433. 5800 2210 Shoreline Radio. Rammstein then "Venus." Good signal tonight. SINPO 44444. 6210 2220 Radio Sluwe Vos. Greetings, The Cure "A Forest", fair reception. SINPO 34333. 6240 2015 Artem's World Music. Indonesian music, fair signal. SINPO 34333. 6300 1655 Radio Flying Dutchman. Chris Montez "Let's Dance," instrumental music. SINPO 34333. On 6325 at 1716 - SINPO 34333. 6305 2200 Radio Fox 48. Polka music, fair signal. SINPO 34333. 6307 1750 Radio Python. Oldies, talk and ID. SINPO 34333. 6920lsb 2150 Baltic Sea Radio. Baccara "Yes Sir I Can Boogie," SINPO 34433. 6960 2155 Atlantic Radio (pres). Audio again tonight, "Singing in the Rain," strong signal. SINPO 54444. 6980 1705 Laser Hot Hits. Killing Joke "Love Like Blood," reading report from Italy. SINPO 34333. The popular Dutch AM-Forum is to shut down for a month. A (translated) statement on the forum said: "The AM-Forum goes a month down. The reason, the team has to refurbish the forum and that needs time. And time is a scarce item in the team, because of the flame wars on the forum. The flame wars takes more time than necessary. On the first of June the forum is back on the air." It seems there have been a lot of quarrels on the forum which have kept the administrators busy so they have decided to take it down during May to return on June 1. 4015 0815 Laser Hot Hits. "Love and Devotion", good signal. SINPO 44433. 5820 0750 Orion Radio. Dutch songs and jingles. Good today. SINPO 45444. 6045 0940 Radio Iceman via Wertachtal. "I Can't Say Goodbye" ID, strong. SINPO 54444. 6172 0920 Misti Radio. Dutch songs, weak-fair. SINPO 24332. 6200 0755 Radio Orang Utan. "Japanese Boy," ID and giving out email address. SINPO 34333. 6205 2030 Radio Jan Kachel (Black Bandit). Strong signal but transmitter problems, said closing down. SINPO 54443. 6208 2135 Radio Mi Amigo. Jingle ID, "Summer Wine," greetings from Tony Stevens, then "Walk Like A Egyptian." Fair signal. SINPO 34333. 6210 0900 Radio Devalon. Reading reports from last broadcast, giving out mailing address. SINPO 34333. 6240 2155 Radio Frieloo. Lively music, fair-good signal. SINPO 34333. 6255 0805 Radio Geronimo SW. Weak signal, ID, rock music. SINPO 24332. Signal improved by 0955 to SINPO 44433. 6280 0810 Radio Merlin Int. Blue Oyster Cult "Don't Fear the Reaper," fair-good. SINPO 34333. 6281 2150 Radio Jan Kachel. ID and easy listening music, transmitter problem fixed. SINPO 54444. 6295 0800 Misti Radio. ID jingle, Dutch song. SINPO 34333. 6295 0927 Radio Shadowman. Madonna "Like A Prayer," then "Spanish Stroll," strong. SINPO 54444. 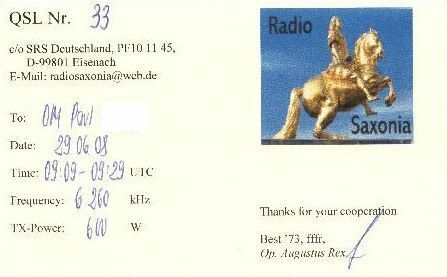 6300 1538 Radio Sallandse Boer in QSO with Witte Reus. Splash from Reflections Europe on 6295. SB 43433 and WR 33333. 6300 1618 Radio Flying Dutchman. Pussycat "Mississippi", fair-good signal, bit of splash 6295. SINPO 43433. 6305 2020 Radio Merlin Int. "Put Your Hands Up," ID, good signal. SINPO 44433. 6323 2005 Magic AM. "Going to Ibiza" Vengaboys, strong signal. SINPO 54444. 6323 2145 Radio Flying Dutchman. ID jingle, country music, good with strong peaks. SINPO 44444. 6325 1418 Radio Merlin Int. Faithless song, then "Whole Lotta Loving." Fair signal. SINPO 34333. 6325 2053 Radio Spaceman. Queen "Killer Queen," strong. SINPO 54444. 6395 2032 Delta Radio. "Jungle Rock," ID jingles. SINPO 44433. 6525 2125 Pony Radio. Dutch music, ID, strong. SINPO 54444. 6550 2045 Radio Rising Sun. Jennifer Rush "Power of Love," fair signal. SINPO 34333. 6930 1530 IMR. Current R&B sounds (which I don't recognise!). SINPO 34333. 6980 0915 Laser Hot Hits. Simple Minds "Alive & Kicking," SINPO 34333. 7610 1638 Radio Geronimo SW. Programme from Keith Jones from New Zealand. Rock music. Strong clear signal. SINPO 55444. 4015 1930 Laser Hot Hits. Songs by Air then Motley Crue. Strong. SINPO 54444. 6240 1920 Radio Caroline & Radio Rainbow. Dance music and jingles, some utility QRM. SINPO 33333. 6245 1815 Ramm Radio. Music by Rammstein, fair signal. SINPO 34333. 6295 1757 Radio Brandaris Int. Instrumental music, ID and greetings. SINPO 34333. 6295 0825 Radio Altrex. Instrumental music, weak-fair signal. SINPO 24332. 6300 1703 Radio Shadowman. Steve Miller Band "The Joker", report to Sallandse Boer. SINPO 54444. 6304 1804 Magic AM. Killing Joke "Love Like Blood," ID and greetings. SINPO 44433. 6324 1840 Radio Fox 48. Polka, ID jingle, "Fox on the Run." SINPO 34333. 6920lsb 1908 Baltic Sea Radio. "Yes Sir I Can Boogie," jingle ID with seagull sounds. SINPO 34433. 6930 1708 IMR. Meatloaf "Bat Out of Hell," good signal. SINPO 44433. 6950 1900 Radio Waves Int. Country music, woman talking in French. SINPO 34333. 6980 0840 Laser Hot Hits. Alexander O'Neill "The Lovers", fair-good signal. SINPO 34333.
will be transmitted in AMPLITUDE MODULATION. 3905 2050 Radio Likedeeler. "Don't Fear the Reaper" Blue Oyster Cult, fair signal. SINPO 34333. 4015 2230 Laser Hot Hits. "One Night in Bangkok," reading report from USA. SINPO 44433. 6292usb 2237 Radio Flying Dutchman. Abba "Money Money Money", ID and thanking listeners in chat. Fair-good but audio not sounding great in SSB. SINPO 34333. 6300 2035 Radio BS. Weak signal, music just adible. SINPO 24332. 6307 2243 Radio Caroline Int. Dance music and IDs, fair. SINPO 34333. 6375 2005 Radio Caroline Int. Dance music, ID jingles, fair signal, some slight CW QRM. SINPO 34333. 6384 1955 Radio Underground. Dutch music, greetings and mention of this blog (thanks). Good-strong signal. SINPO 44444. 6400 2000 Unid. Slade "Radio Wall of Sound", strong but off with no ID. SINPO 54444. 6450 1950 Radio Mustang. ID, Shakira "In the House," strong. SINPO 54444. 6930 2025 IMR. JJ Cale then Bruce Springsteen songs, strong. SINPO 54444. 6980 2015 Laser Hot Hits. Britney Spears "Oops I Did It Again," SINPO 54444. 4015 2010 Laser Hot Hits. It Bites "Brave New World," Paul Stuart talking about buying radio equipment. SINPO 44433. 6980 2000 Laser Hot Hits. Songs from Blondie and Procul Harem. SINPO 44433. 3930 2030 Radio Batavia. IDs, Irish musc, weak-fair signal. SINPO 24332. 4015 2035 Laser Hot Hits. Joe Jackson "Stepping Out," Laser jingles. SINPO 34333. 6305 2005 Hans Radio. Dutch music, IDs. Good signal. SINPO 44433. 4015 1905 Laser Hot Hits. Jonah Lewie "You'll Always Find Me in the Kitchen At Parties." SINPO 34333. 6240 1915 Radio Caroline Int. Dance music, jingles and IDs. Fair signal. SINPO 34333. 4015 2025 Laser Hot Hits. George McRae "Rock Your Baby", talk about Irish radio. SINPO 44433. 6305 2005 Radio Osaka. ID, email, said closing down soon. Fair signal but splash from strong unidentified station on 6295. SINPO 33333. 6325 2010 Bad Boys Radio. Florence & The Machine song, ID jingles, off 2018. SINPO 34333. 6980 2019 Laser Hot Hits. KC & The Sunshine Band song, good signal. SINPO 44433. 4015 1720 Laser Hot Hits. Tony James show. Pretenders "Talk of the Town," SINPO 34333. 5800 1340 Polaris Radio. Tiffany "I Think We're Alone Now," ID jingle. SINPO 34333. 5820 0805 Orion Radio. Dutch songs, good signal. SINPO 44333. 6005 0910 Radio Gloria via Radio 700. "Gloria", also on 6140. SINPO 34333. 6045 0925 XVRB via Wertachtal. Eddie Daniels "I Want to Know," talk about website, then Elvis "Hound Dog." SINPO 55444. 6095 0838 Radio Scotland Int. ID and greetings, Creedence Clearance Revival, off at 0900 to make way for KBC. SINPO 55444. 6095 KBC via Wertachtal. Sign on with Rolling Stones "Satisfaction." SINPO 55444. 6140 0908 Radio Gloria via Wertachtal. Talk about station's name, comes from The Doors "Gloria", which he then played. SINPO 55444. Also on 6005. 6200 0752 Radio Orang Utan. Dutch song, then Supertramp "Give A Little Bit." SINPO 34333. 6205 0920 Misti Radio. Rock n roll, weak with fair peaks. SINPO 24332. 6234 0757 Delta Radio (Gelderland). Dutch songs, ID 0803. SINPO 44433. 6240 1800 Sluwe Vos Radio. Weak signal, music heard, ID through the pirate chat. SINPO 24332. 6255 2147 Radio Mi Amigo. Blur "Girls & Boys" then Swing Out Sister "Your On My Mind." Good signal but some fading. SINPO 44333. 6280 1030 Radio Merlin Int. Boney M "Brown Girl in the Ring", good signal but quite fady. SINPO 44433. 6290 1335 Radio Rainbow. Talk about peace, music, weak signal. SINPO 24332. 6296 1015 Neutron Radio (Radio Black Bandit). Country music, fair-good signal. SINPO 44433. 6304 0843 Ghost Radio. Shocking Blue "Venus", ID and greetings. SINPO 34333. 6307 2145 The Ghoul. The Police "Every Breath You Take" then Tenpole Tudor "Swords of A Thousand Men," then transmitter went off. Strong. SINPO 54444. 6375 0855 Radio Sallandse Boer. Boston "More than a Feeling," ID, SINPO 44433. 6930 1110 IMR. Song called "In My Dreams," ID and jingles. Fair signal. SINPO 34333. 6980 1100 Laser Hot Hits. Martin Scott show. Simple Minds "Don't You Forget About Me." SINPO 34333. Rage FM, an FM pirate broadcasting from Taunton, Somerset (in the west of England), was taken off the air on Wednesday after a raid by Ofcom. A statement on their Facebook page said: "Rage Taunton has been killed off as a result of an ofcom raid on our Taunton Transmitter apparatus. We are pleased to confirm nobody from Rage was onsite at the time. We shall NOT be defeated by this fairly minor mishap or any of the killjoy straight edge bores!!!!! Thanks to everyone who've supported this positive project in Taunton area over the past year, thank you very much indeed! we'll be back...as soon as possible ;)." The station has been on the air just over a year broadcasting what it calls "an alternative to mainstream media." The Bristol Radio Recordings blog reported yesterday that Rage was back testing on 100.6 and 104.5. 3905 1915 Skyline International Radio. Dutch song and ID, closed down 1917. SINPO 34333. 4015 1643 Laser Hot Hits. Martin Scott show. Siouxsie & The Banshees "Hong Kong Garden." SINPO 34333. 5885 1840 Radio Morning Star. Music heard but signal quite weak. SINPO 24332. 6199 1618 Delta Radio (Gelderland). Polka, fair-good signal. SINPO 34333. 6210 1840 Radio Grolschman. Rock music and IDs, fair signal but audio quite low, strange noise just below (6207-8). SINPO 33333. 6240usb 1825 Radio Fox 48. Country music, fair signal. SINPO 34433. 6256 0901 Radio Focus Int. Squeeze "Tempted," ID, Scorpions "Winds of Change," fair signal but some fading. SINPO 34333. 6295 1800 Radio Spaceman. Abba "Ring Ring" , ID and greetings, usual strong signal. SINPO 54444. 6320 1815 Skyline International Radio. Head briefly here, utility splash. SINPO 33333. 6510 1925 Radio Rising Sun. Depeche Mode "Can't Get Enough", fair signal. SINPO 34333. 6930 0810 IMR. Current dance/r&b tunes, IDs. SINPO 34333. 6950 1905 Radio Waves Int. Country music, fair signal but dead air after record ended. SINPO 34333. 6960 1625 Atlantic Radio (pres). Relay of legal Irish station Newstalk with sports programme. Strong. SINPO 54444. 6980 0816 Laser Hot Hits. Katy Perry song, fair signal. SINPO 34333. 9510 0900 Radio City via IRRS. 60s music, "station of the cars" ID, off 0900. SINPO 44433. 15843usb 0910 Radio Spaceshuttle. "Knock on Wood," IDs, weak signal with occasional peaks. SINPO 24432. Better signal at 1648, "The Final Countdown." SINPO 34433. Wizard Radio writes: "The latest MW Pirate Review is now ready to download. Edition number nine for April contains many recordings, most of them made at our location, but some also from Wire UK in the north-west of England and a superb recording of Radio Barones made in Newfoundland. There are also some excellent recordings made in the Netherlands by Radio Zeewolf. 4015 2000 Laser Hot Hits. Reading reception report, Gordon Lightfoot "Sundown." SINPO 44433. 5810 2025 Radio Relmus. "New York Groove," ID and greetings, Alan Parsons Project "Eye in the Sky." Fair signal. SINPO 34333. 6240 2005 Radio Caroline Int. Pop music, ID jingles, splash from strong utility on 6245. SINPO 33333. 6256 2010 Radio Focus Int. Olivia Newton John & John Travolta "You're the One that I want," ID and giving hotline number and email. Fair-good signal. SINPO 34333. 6295 1855 The Ghoul. Talking about radio valves and the Cold War, Nik Kershaw "I Won't Let the Sun Go Down." SINPO 54444. Strongest signal tonight! Off at 2205. 6304 2145 TRX Radio. Jingle ID, blues music, squeezed between strong signals on 6295 & 6308. SINPO 53443. 6308 2150 Radio Sallandse Boer. Sixties music, ID and greets to Dr Tim, some splash from 6304. SINPO 53443. 6325 2015 Radio Zodiac Int. ID and greetings, blues rock, good signal with strong peaks, said using 100W. SINPO 44433. 6510 1908 Radio Rising Sun. ID, then The Beatles "From Me to You." SINPO 34333. 6735 2200 Cool AM. Unusual frequency, weak signal, offshore radio feature. SINPO 24332. 6930 1912 IMR. Pussycat "Mississippi", ID, utility QRM. SINPO 43443. 6980 1917 Laser Hot Hits. Windsurfers "Surfing," The Beatles "Paperback Writer." SINPO 54444. 4015 2036 Laser Hot Hits. Laser Goes DX with Gary Drew, shortwave news. SINPO 34333. 6305 2012 Radio Spaceman. Donna Summer "State of Independence," ID and greetings. Strong. SINPO 54444. 6325 2018 Unid. Phil Collins "I Can't Dance", off with no ID. SINPO 34333. 6980 2023 Laser Hot Hits. Barbara Dickson song, reading report from Germany. SINPO 34333. 6980 1715 Laser Hot Hits. Tony James show. Voyage "From East to West," SSB QRM, occasionally strong. SINPO 43433. 4015 2147 Laser Hot Hits. Recording of Caroline 558, Good signal. SINPO 44433. 5815 1905 Radio Relmus. ID, greetings, The Who song, SINPO 34333. 6295 1855 Radio Tarzan. Dutch songs. Good signal. SINPO 44433. 6980 1900 Laser Hot Hits. Ultravox "Dancing With Tears in My Eyes," SINPO 44433. 4015 2023 Laser Hot Hits. Tony James show. Dire Straits "Tunnel of Love" and Gerry Rafferty "Get It Right Next Time." The station is celebrating its 22nd birthday ... happy birthday! SINPO 34333. 6240 2035 Bad Girls Radio. Laura Branigan "Self Control," ID by woman with email address. SINPO 34333. 6980 2015 Laser Hot Hits. Al Stewart song, ad for FSN News, then Devo from 80s. SINPO 34333. 3930 2036 Radio Batavia. Talk and music, weak signal. SINPO 24332. 4015 2031 Laser Hot Hits. Kate Bush "Running Up the Hill," SINPO 34333. 6210 1743 Bluestar Radio. Bryan Adams "Summer of 69," ID. SINPO 44444. 6240 1938 Sluwe Vos Radio. ID and greetings, oldies. SINPO 34333. 6325 1740 Radio Rainbow. ID, Talking Heads "Take Me to the River," SINPO 34333. 6374 2010 Radio Caroline Int. Rock music, recordings of offshore Radio Caroline, fair-good signal. SINPO 34333. 6383 1835 Radio Underground. ID and greetings, Depeche Mode "Leave in Silence. " SINPO 34333. 6420 2018 Radio Tidalwave. ZZ Top "Sharp Dressed Man", ID and greetings to listeners on the chat. Strong. SINPO 54444. 6510 1840 Radio Rising Sun. T'Pau "Take My Breath Away," fair signal. SINPO 34333. 6526 2042 Wizard Radio. Testing, dance music. Good signal. SINPO 44433. 6930 1905 IMR. Ian Dury "Hit Me With Your Rhythm Stick," IDs at "IMR", SINPO 44433. 6960 1850 Atlantic Radio. Relay of legal Irish station Newstalk, good signal. SINPO 44444. 6980 1845 Laser Hot Hits. Relay of Radio Caroline from the 80s, iding as "Caroline 558". SINPO 44433. 3901 1803 Delta Radio. Dutch song, ID and said testing new transmitter and modulation. Good signal. SINPO 44433. 4015 1720 Laser Hot Hits. Billy Joel "Moving Out", Laser jingle then Spandau Ballet "Communication." SINPO 34333. 6240 1745 Radio Onda Caliente. IDs and instrumental music, weak-fair signal. SINPO 24332. 6300 1757 Radio Spaceman. "Una Paloma Blanca," moved from 6295 where was another station. Strong. SINPO 54444. Back on 6295 at 1840 to avoid station on 6305. 6295 1654 Radio Flying Dutchman. ID jingle, instrumental music, running 100W. Fair signal. SINPO 34333. 6305 1640 Radio Osaka. Oldies, weak-fair signal. SINPO 24332. 6510 1817 Radio Rising Sun. Culture Club "Do You Really Want to Hurt Me." Weak-fair. SINPO 24332. 6930 1645 Irish Music Radio. "This Old Heart of Mine," then "Magic Potion," fair-good. SINPO 34333. 6980 1650 Laser Hot Hits. Level 42 "Heaven in My House", good signal but SSB QRM. SINPO 43433. 4015 2155 Laser Hot Hits. Instrumental music and start of Paul Stuart show, Travis "Sing," fair-good signal but some utility splash. SINPO 44433. 6240 1940 Radio Caroline Int. Barry White "Let The Music Play," ID jingles. SINPO 34333. 6305 1950 Radio Countdown. Moby "Why Does My Heart," good signal. SINPO 44433. 6420 1935 Radio Mustung. The Monkees "I'm A Believer," strong. SINPO 54444. 4015 2045 Laser Hot Hits. Peter Gabriel song, fair-good signal. SINPO 34333. 6295 2003 Radio Mi Amigo. Billy Idol "White Wedding," "Death of a Clown." SINPO 44433. 6305 2015 Radio Witte Reus. Abba "Dancing Queen." SINPO 34333. 6980 2035 Laser Hot Hits. Music heard but weak signal. SINPO 24332. 4015 2045 Laser Hot Hits. Alice Cooper "No More Mr Nice Guy", good signal but occasional QRM. SINPO 43433. 6295 2015 Radio Spaceman. A very entertaining show with Major Tom singing along to records, including the Beatles "Let It Be." SINPO 54444. 6980 2030 Laser Hot Hits. Talking about shortwave QRM, expensive haircuts, song "Don't Shed A Tear." SINPO 44433. 4015 1925 Laser Hot Hits. Ian Lawrence show. James "Born of Frustration." SINPO 44433. 6290 1740 Radio Tarzan. Dutch music, talk in Dutch and English. Good signal. SINPO 44433. 6305 1745 Radio Osaka. "Dragon's Lair" music, fair signal. SINPO 34333. 6325 1915 Radio Caroline Int. Dance music, recordings of offshore Radio Caroline. SINPO 34333. 6980 1905 Laser Hot Hits. Madonna "Power of Goodbye," talk about price of stamps going up. SINPO 44433. We hope that you were enjoying your Easter holidays and that the first signs of spring are already visible at your hometown. Well, we would like to support that by sending you some funky tunes through the magical world of shortwave-radio. We use Radio 700's transmitters in Kall-Krekel, Germany (with 1000 Watts). Furthermore, we can be heard on Radio 700's online live streaming. Just go to <http://radio700.de/player/player_kw.php?p=1> and select the frequency we are currently broadcasting on. These streams and frequencies normally carry the broadcasts of Radio 700. Once again, we will bring you some current (Indie) pop and rock music from all over the world and hope to bring you 60 minutes of entertainment and joy. Furthermore, we have a short listeners' mailbox-program and invite you to send us again your comments and reception reports. Detailled and correct reports will be verified with our new QSL card (by regular mail or email). Of course we are also glad to hear from you what you think about our choice of music or if you have any advice for us regarding new bands etc. We are excited to read where our little "student-radio-project" can be received. Feel free to forward these information to your DXing friends. possible thanks to www.shortwaveservice.com (see this page for technical details and schedule updates!). 4015 2145 Laser Hot Hits. Chris Jones song. Good signal. SINPO 44433. 6210 2150 Radio Sluwe Vos. Dire Straits "Sultans of Swing," ID jingle. Fair reception. SINPO 34333. 6240 2110 Radio Focus Int. Coldplay song, ID jingles. Fair signal. SINPO 34333. 6930 2125 Irish Music Radio. More Coldplay. SINPO 34333. 6980 2115 Laser Hot Hits. "Amigo." Fair signal. SINPO 34333. 4015 2130 Laser Hot Hits. "Send Me An Angel", reading reception reports, good signal. SINPO 44433. 5820 0737 Orion Radio. Mention Saxonia, Abba "Chiquitita", good signal. SINPO 44433. 5820 0920 Radio Scotland Int. Report to Orion, "Pepperbox," off 0922, fair signal. SINPO 34333. 6200 0745 Radio Orang Utan. Rock music, fair reception. SINPO 34333. 6220 1203 Bogusman. Reading reception reports from Scotland, Germany, Sweden and France. Also said he hasn't got QSLs at the moment. Strong signal. SINPO 54444. 6240 0802 Radio Focus Int. Keith Archer programme. ID, Dio "Rock n Roll Children." SINPO 44433. 6265 1405 Radio Geromino SW. ID, ELO song, Dave Scott talking about the pirate radio chatroom. Fair signal. SINPO 34333. 6290 0840 Radio Spaceman. Dutch music, greeting listeners (thanks for mention), strong signal. SINPO 54444. 6295 0944 Wizard Radio. Report for Radio Spaceman. Fair signal but fady. SINPO 34333. 6300 0800 Crazy Wave Radio. Rock music, weak with splash from 6305. SINPO 23332. Also on 7425. Big difference in the signal strength by 2100 ... SINPO 53443, although some splash from Reflections Europe on 6295 and strong station on 6305. 6305 0750 Radio Tarzan. Dutch music, ID. SINPO 34333. 6310 1015 Radio Condor. ID, email address, instrumental music. SINPO 34333. 6325 0933 Radio Scotland Int. Moved from 5820, ID, "Wipeout", strong signal. SINPO 54444. 6325 1425 Pony Radio. BZN, good to strong signal. SINPO 44433. 6326 1740 Bad Boys Radio. ID and email address by woman and off, some SSB QRM. SINPO 33333. 6374 1010 Wizard Radio. Moved from 6295, ID, fair signal. SINPO 34333. Heard again at 2045 with SINPO 34333. 6383 1430 Radio Underground. ID and greeting listeners, Dutch music. Good signal. SINPO 44433. Moved to 6325 at 1439, still 44433. 6420 1530 Radio Tidalwave. ID, dance music, then dance version of "China in Your Hand." Good-strong signal. SINPO 44433. 6450 1535 Radio Mustang. Kim Wilde "You Came," ID, strong signal. SINPO 54444. 6450 2050 Uncle Sam Radio. Gloria Gaynor "I Will Survive", strong. SINPO 54444. 6510 1545 Radio Rising Sun. IDs, "I've Been Around the World", weak signal. SINPO 24332. 6930 0815 Irish Music Radio. Elkie Brooks "The Way You Do the Things You Do." SINPO 34333. 6940 0807 Radio Waves Int. ID, country music. SINPO 34333. 6980 0810 Laser Hot Hits. Kate Bush "Never Forever," fair signal. SINPO 34333. 7265 0937 Radio Pacman. Voice only transmission, using 20W, greeting Wizard. Fair signal. SINPO 34333. 7265 1005 Trans Europe Radio. Report to Pacman, ID, and off 1007. SINPO 34333. 7425 0907 Crazy Wave Radio. Andy Walker talking, oldies but poor signal. SINPO 24332. 9480 0900 MV Baltic Radio. Signing on, weak signal. SINPO 24332. 3930 2238 Radio Batavia. Toto "Africa", fair signal. SINPO 34333. 4015 2225 Laser Hot Hits. Laser 558 recordings, "Boogie Woogie No More." SINPO 44433. 6291 2045 Radio Sallandse Boer. ID and music, only weak here with utility QRM. SINPO 23332. 6300 2040 Unid. Funky music, good signal but no ID. SINPO 44433. Maybe CWR testing? 6305 2050 Radio Spaceman. Band closing earlier tonight, only weak signal with splash from 6300. SINPO 23332. 4015 2202 Laser Hot Hits. "The Lion Sleeps Tonight," fair signal. SINPO 34333. 6240 2235 Radio Frieloo. Dutch music, ID and email address at 2241. Good signal but some fading. SINPO 44433. 6295 1810 Radio Spaceman. Shadows "Apache", ID, then Dutch music. Strong. SINPO 54444. Signal still powering out at 2210 - SINPO 54444. 6305 1815 Radio Osaka. Blues rock, fair signal but utility QRM. SINPO 33333. 6305 2250 Radio Marconi. Dutch music, ID and greetings. Good signal but quite fady. SINPO 44433. 6325 1850 Radio Waves Int. Long talk, weak-fair signal. SINPO 24332. 6585lsb 2215 Unid. Italian music and talk in Italian. Fair-good strength. SINPO 44433. 6925 1818 Radio Black Arrow. ID and greetings, Eurythmics "Sweet Dreams Are Made of This. SINPO 44433. 6930 1820 Irish Music Radio. Oldies and IDs, good signal. SINPO 44433. 6980 2155 Laser Hot Hits. "Let the Music Play," strong but utility QRM. SINPO 53443. 6295 1523 Misti Radio. "Rock Around the Clock," heard on 6292 at 1536. Fair signal. SINPO 34333. 6305 1510 Radio Altrex. "Just Leave the Light On" and "Lady in Red." ID and cow noises at 1531. SINPO 34333. 6328 1518 Stress Radio (Black Bandit). Country music, strong signal, off 1537. SINPO 54444. 6980 1545 Laser Hot Hits. Talk Talk "It's My Life." Fair signal. SINPO 34333. 3910 2010 Radio Festivum. Eurythmics "Here Comes the Rain", then ID jingle. SINPO 34333. 4015 2005 Laser Hot Hits. Talk about the Eurovision Song Contest, Engelbert Humperdinck "Please Release Me" (he's the UK entry this year!). SINPO 54444. 6295 1913 Radio "High Voltage". "Born to be Wild", "Heat is On," then Laser 558 recordings. No ID but operator in pirate chat, said using 20W. Good with strong peaks. SINPO 44433. 6300 1946 Radio Witte Reus. 60s guitar music, ID and email address, some spalsh from 6295. SINPO 43433. 6980 1951 Laser Hot Hits. Tony James show. Pretenders "Talk of the Town." SINPO 54444. 4015 1935 Laser Hot Hits. Electronic "Get the Message," Good signal. SINPO 44433. 6293 1735 Radio Altrex. ID and chat, Golden Earring. Was on 6290 & 6295 before. SINPO 34333. 6305 1730 Radio Tarzan. Country rock, ID and greetings, good signal. SINPO 44433. 6325 1750 Top Radio. Dutch music. Weak-fair. SINPO 24332. 6325 1920 Radio Skywire. Johnny Cash "Walked the Line", fair signal. SINPO 34333. 6450 1740 Radio Merlin Int. "Let's All Chant" Michael Zager Band. SINPO 44433. 6980 1925 Laser Hot Hits. Britney Spears "Criminal," SINPO 44333. 4015 1920 Laser Hot Hits. Mike Andrews show. Whitney Houston "Where Do Broken Hearts Go." SINPO 34333. 6240 1911 Radio Focus Int. ID jingle, Ultravox "Vienna." SINPO 44444. 6325 1900 Radio Underground. Reggae, SSB QRM. SINPO 43433. Moved to 6304 at 1906, talking about the HF global pirate weekend. SINPO 44444. 6375 1842 Radio Caroline Int. IDs and pop music, fair signal. SINPO 34333. 6420 1837 Unid. "Telstar" tune, good signal, off with no ID, QRM with 6423. SINPO 43433. 6423 1830 Radio Oscar Zulu. Moody Blues "Whiter Shade of Pale." QRM from 6420. SINPO 43443. 6930 1846 IMR. Calvin Harris & Rihanna song, occasional bursts of utility. SINPO 43443. 6980 1853 Laser Hot Hits. Mike Andrews show. Lightning Seeds "Pure" (which according to a listener was a secret code record used by Caroline to signify a successful tender delivery!). Good signal. SINPO 44444.